January kicks off 3 weeks with DANA moderating the MDL (minidolllist.com). 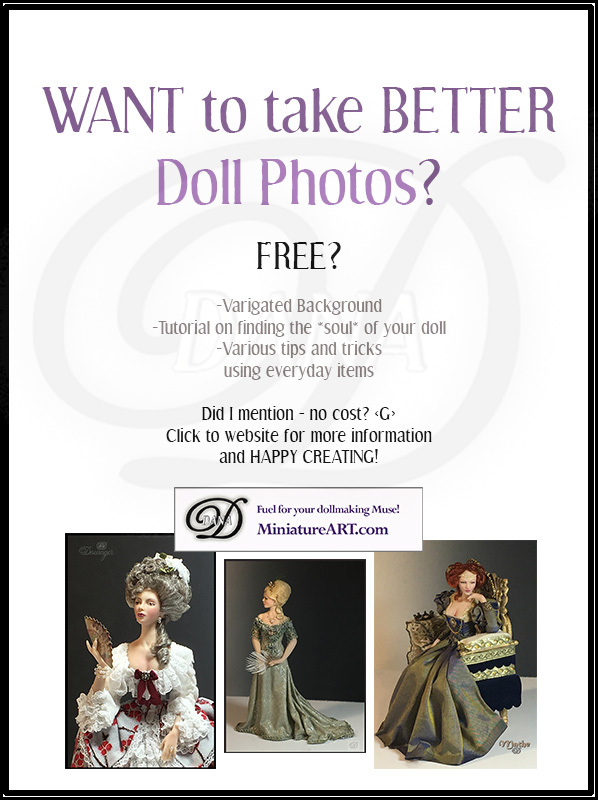 *Finding the SOUL* of your doll in photography ... (including a tutorial on making your own backdrop)! 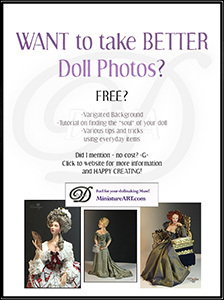 WHY do you want to take photos of your dolls? The answer will pave the way - to the DEPTH of your involvement in this process. For example ...Sharing with friends? ..... Inclusion in magazines? .....Selling your work? Many artists will only buy professional equipment - light box, an amazing digital camera, reflectors, and close up lenses. For others, wanting to record the *SOUL* of your doll in print... a scored piece of foam core, two lamps and a camera phone are ALL you need! To find your path ... simply check back (here) daily during the lst week in January for new tutorials .. and HAPPY CREATING! 1. Buy a black piece of foamcore board. The THICKER kind - tend to be sturdier! 2. Score a groove on one side - and bend in half (or size desired). 3. Spray paper (top) with water mister. This will sag off , leaving the poreous (granite like) texture underneath. 4. I superglued a wood strip along seam to provide support (and keep board in *L* shape). 4. Now sponge Gesso on. Let dry, and responge any spots that are too dark. 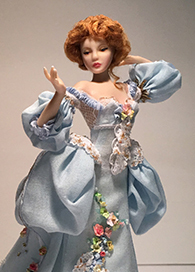 Doll #2 (End of January)... will be standing on the top step look back over her shoulder, with intricate train falling down steps. Charles is making up a few extra for those interested. 5. To add color to your backdrop, grab a makeup sponge, and DAB on chalk in random, circular motions. You now have a very pretty backdrop for your setting/doll pictures! **NOTE** I did a VERY fast tutorial on this - you could chalk the wood - so it wouldn't show in finished photos as well!